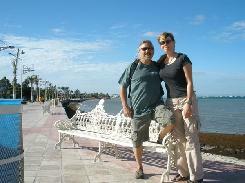 We've been living in Marina Palmira since Dec. 17th. A lot has gone on since we got here. On Sunday Dec 7th in downtown La Paz they had a tribute to John Lennon. There was a group of musicians playing The Beatles and John's songs at a free concert. It was AWESOME! The town is all lit up with Christmas decorations and there's even lights in the palm trees on the Malicon. It's a bit strange for Laura and I, being the first Christmas holiday we haven't been in Lake Tahoe in about 25 years. No white Christmas here. It's been tee shirts, shorts and lots of sunshine. The boat is coming along we should have the engine going right after Christmas and Laura's almost done with all the bright work. Hanali is starting to get her cool look again. We are definitely the slums of the neighborhood with the smallest and oldest boat. All the boats around us are Buco Bucks and Big! But everyone likes our "little boat that could". 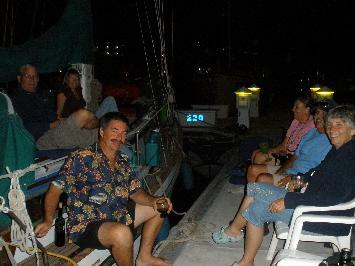 We just met John and Barb and had some drinks the other night on Naida, their boat. Talk about a nice boat! And roomy. Oh man, was there space. So here we sit on our humble little floating home, enjoying Christmas in Mexico.